I am so excited to do this! I am finally releasing a brand new ebook I just finished writing. I hope it will challenge and bless many youth ministries who are just floating from one event and lesson series to the next without any clear focus or direction. Watch the video to learn more! Shoot a quick little video sharing your story and how you could use the money. Submit it to me using this form by December 9, 2011. A team of judges will pick 4 entries and from December 12-20, 2011, those stories will be posted here on LISM for others to vote for who the money should go to. On December 21, 2011, I’ll announce the winner, write the check for 50% of whatever the ebook proceeds have been, and drop it in the mail. DETAILS: This giveaway is open only to US residents who are at least 21 years old and are currently serving in a church as a volunteer, part-time, or full-time youth worker. Half of all proceeds, up to $5,000, from this ebook between now and December 20, 2011, will be given to the most-voted youth worker video entry. This practical “how to” ebook will walk you and your team through a 30-step process to discovering what God’s vision is for your unique ministry context. The process also helps your church take ownership of the vision while you implement it together and put metrics in place to evaluate what in the ministry is moving the vision forward and what isn’t. 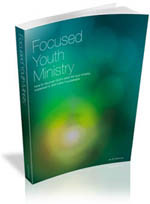 Learn more about, “Focused Youth Ministry: How to Discover God’s Vision for your Ministry, Implement It, and Make It Sustainable,” and download a sample from the ebook. Vote for a Youth Worker to get Money!